Hours after California and 19 other states filed a lawsuit to try and stop President Trump from appropriating funds for his border wall via his national emergency declaration, President Trump flew to Calexico for a press conference with immigration agents and border patrol officials that was tantamount to flipping a giant middle finger to the state's recently inaugurated, rapidly anti-Trump governor, Gavin Newsom. Not to mention California Attorney General Xavier Becerra, who has repeatedly challenged the Trump administration on immigration-related issues. Bolstered by a flurry of news stories about the rapidly deteriorating situation at the border, which is being exacerbated by an unprecedented surge in the number of asylum seekers from Central America, Trump declared that at least 400 miles of his promised wall would be built over the next two years, and blamed Democrats for the slow progress so far. Trump has been pushing Congress to tighten asylum rules, to make it harder for migrants to qualify. 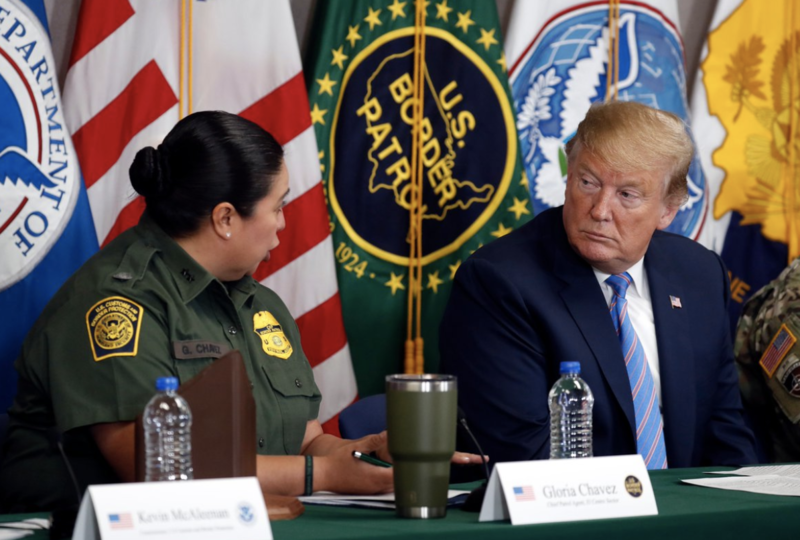 Notably, his visit came a day after he withdrew his nominee to lead ICE, the longtime border official Ron Vitiello, who had appeared to be on track for confirmation until Trump decided he wanted to go in a "tougher direction." He also repeated his explanation for backing off his threat to close the border, saying that Mexico has been cracking down on migrants traveling through its territory, and reiterated his threat to tariff auto parts and close the border if significant progress hasn't been made in a year, according to the Associated Press. During the press conference, Trump shared a message to migrants that he described as "our new statement," and warned anyone traveling to the US - whether it's to declare asylum, or enter illegally - to instead "turn around." "This is our new statement- the system is full. We can't take you anymore. Whether it's asylum or anything you want - illegal immigration - we can't take you anymore. Our country is full. Our area is full. The sector is full. Can't take you anymore, I'm sorry. Turn around." During the meeting, Trump was presented with a piece of the future border wall. Unsurprisingly, the president's visit triggered Gov. Newsom to condemn the president's efforts to shut down immigration,.